Google has announced the arrival of the latest version of its web browser – dubbed Chrome 3.0. Many improvements have been made to browser, including the boast that it is now 25 per cent faster than before. This means it's now one-and-a-half times speedier than the very first incarnation of Chrome. 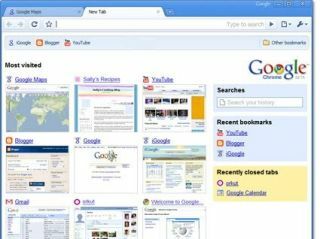 While a lot of the changes have been made under the bonnet – there's been 3,505 bug fixes in the last year – visual tweaks include a neater version of the browsers tabs. The New Tab section has been completely re-designed and offers better customisation. Another improvement is the site's 'Omnibox'. This is the 'uber' web address bar, which also acts as a search bar. New icons and a better presented drop-down menu have been added to this. Google has also taken a leaf out of Firefox's browsing book and is now offering themes, so you can now customise Chrome like never before. Couple this with the addition of video HTML5 capabilities to the browser, without the aid of a plug-in, and what you have is a viable alternative to the likes of Internet Explorer and Firefox. Find out more about Chrome by visiting the Google Blog or pointing your browser to www.google.com/chrome.